On a Sunday in 1912, a group of Hancock Park neighbors asked Dr. G. C. Patterson, minister of Wilshire Presbyterian Church, to meet with them after service. They had raised $1,500, and they wanted to build a new home for the parish. Dr. Patterson recommended that they pay a deposit on a cornfield on the corner of Western Ave. and Third St.
A modest wooden structure was built on the site, and it worked well until 1919, when Rev. John Albert Eby was installed as pastor. His first act was to build a larger church to facilitate a growing congregation, and between 1920 and 1930, $522,678 was raised. Architect Robert Orr was brought in to build a gothic-style cathedral with a high central tower. Tragedy struck in 1977 when the cathedral burned to the ground in an apparent arson. A new building was erected in 1980. Last month, congregants gathered in that building for a worship service to celebrate Wilshire Presbyterian’s 100th year. 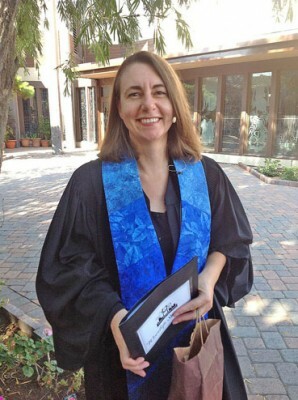 Much has changed over the years, said Jacoba “Kobie” Vermaak, who was installed as the seventh pastor last February. But much has remained the same. “Throughout its history, WPC has been active in the life of the Wilshire district and has shown the desire to reach out and connect with the community around the church,” said Vermaak. In its heydey in the 1920s and 30s, the church had 1,500 members. It was the place to be seen, with a radio ministry and movie clips shown during the worship service, said Vermaak. But after the cathedral-style building burned down, the church built a modest sized church. The whites moved out and immigrants from all over the world settled in the surrounding neighborhood. The church embraced this new reality. It had become an urban church, and feeding the hungry at its doorstep became important. Providing healthcare for the poor became important. Providing space for neighborhood groups became important, so the Parish House was converted into a Community Center. And the chapel was changed into a Music Academy so kids in the neighborhood could be enriched by music, explained the pastor. Currently, the Center serves as a meeting place for community organizations and Alcoholics Anonymous meetings. It also hosts a food pantry that, in partnership with HopeNet, provides free groceries to those in need. WPC also provides free parish nurse services in partnership with QueensCare Health and Faith Partnership. After 100 years, Wilshire Presbyterian Church continues to move onward towards many more years of dedicated service to God and the community, she added.